Imagine Sitting In Your House Looking Out The Window When… OMG, IT’S COMING FOR US. 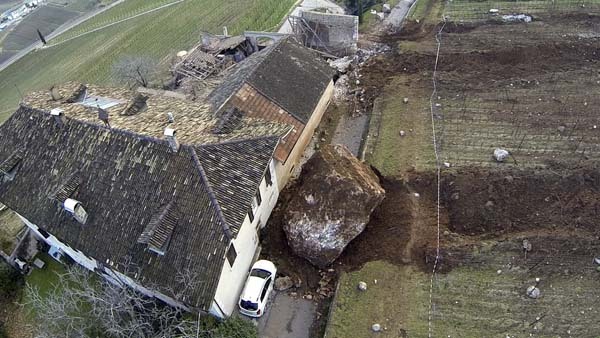 There”s a farmhouse in northern Italy that almost faced complete destruction from something no one expected: a nearby boulder. The house narrowly escaped destruction during a landslide in its town of Ronchi di Termeno. A massive boulder was let loose during the event and nearly rolled straight through the house. Luckily, no one hurt and most of the house survived. The house was missed by literal feet. It rolled all the way into the vineyards by the house. But a second boulder just rolled right up next to the house. And that”s why you don”t build a house in Italy… in a landslide zone. Source: buzzfeed.com Share so others can beware of boulders. Even though they really can”t do much about it.